Prior to becoming Kentucky�s first republican governor in 32 years, Ernie Fletcher was an Air Force fighter pilot, family doctor, engineer, lay minister, state legislator, and U.S. congressman. He become Kentucky�s 60th governor in 2003. His term lasts until 2007; state law allows him to run for a second term. Fletcher is originally from Montgomery County; he spent much of his life in Fayette County. Fletcher entered public life when he was elected to the Kentucky state legislature from the 78th district. In 1998 he was elected to the U.S. Congress. He left his seat in congress when he was elected governor. Ernie Fletcher: Biography - Biographical information related to the governor. Indictments against former Transportation Cabinet Secretary Bill Nighbert and highway contractor Leonard Lawson have been revised. The indictments stem from payments Lawson allegedly made to Nighbert and Dept. of Highways District 7 Chief Engineer Jim Rummage in order to receive confidential information regarding open highway construction bids. Gov. Ernie Fletcher is considering suspending the state’s gas tax. Such a move would result in a huge loss of income to the state’s road fund. Several news reports this week shed more light on the alleged violations of the state’s hiring merit system in the Transportation Cabinet under Gov. Fletcher. Douglas W. Doerting, assistant director of personnel in the cabinet, alleged in a formal complaint that the hiring decisions were made using an “illegal political patronage” system. On Tuesday a search warrant was served on the Governor’s office. A letter from the Federal Highway Administration detailing how the Kentucky Transportation Cabinet had failed to meet its Affirmative Action goals has also surfaced. It was reported that he U.S. government might freeze $600 million in Kentucky road projects because the Transportation Cabinet hired almost no minorities in 2004: of 317 merit employees hired during that time 97% were white; however, later reports claimed there was no immediate threat of the freezing of road funds. On Wednesday, March 23, 2005, Gov. Ernie Fletcher unveiled signs to mark the proposed corridor of I-66 through Southern Kentucky at events in Glasgow and Columbia. 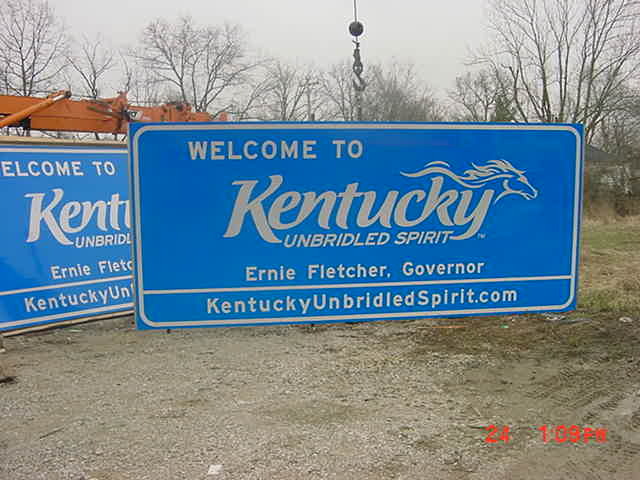 As of Friday, March 25, 2005 at least two of these signs had been installed along the Louie B. Nunn Cumberland Parkway: one along the parkway’s eastbound lanes at its western terminus and one along the westbound lanes at exit 11. 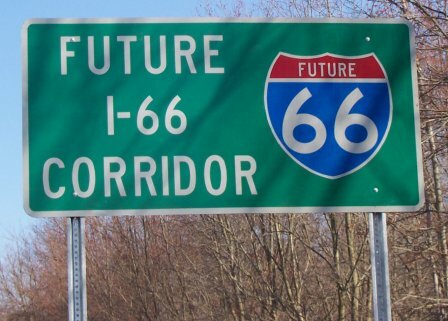 See also: Louie B. Nunn Cumberland Parkway route marker and Future I-66 Corridor marker. Kentucky Transportation Cabinet Secretary Maxwell Clay Bailey resigned Monday to become head of the Kentucky Department of Emergency Management. The retired Air Force general was appointed as head of the transportation cabinet by Gov. Ernie Fletcher in December 2003. Bailey will be replaced by Bill Nighbert on an interim basis. Mike Goins has been appointed to the position of Executive Director of the Office of Public Affairs for the Transportation Cabinet. Goins, a native of Cumberland, has previously worked for the Ashland Alliance and in television news for WSAZ-TV in Huntington, WV and WYMT-TV in Hazard. 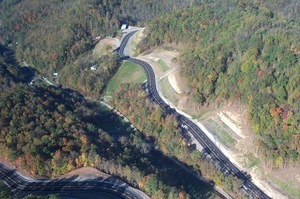 Other recent Transportation Cabinet news releases include information about the Adopt-a-Highway Program and information about the dedication of the new transportation building . Several photographs of the new building have been posted here and here . Gov. Ernie Fletcher says that there is no political will for increase in the gasoline tax that would fund upcoming transportation projects. Kentucky’s gasoline tax stands at 16.4-cents and is the lowest amount 10 neighboring and nearby states. The current tax rate is expected to generate revenue far short of what would be required to complete projects currently listed in the six year highway plan. When asked about the situation, State Representative Rob Wilkey (D-Scottsville), chairman of the House budget subcommittee on transportation, said that there is only a one-in-seven chance of any particular project being funded. Governor-Elect Ernie Fletcher, who will become Kentucky's first republican governor in 32 years, has named former Transportation Cabinet secretary Fred Mudge to head the transportation cabinet transition. Mudge was Gov. Patton's first transportation secretary.